Visitation is on a fixed schedule. Any special visitation requests must be submitted to the Jail Administrator, at least one week in advance of the visit. Visitation may be limited to control the number of inmates having visits at any one time. There will be no visitation on holidays or weekends. If an inmates visit fall on a holiday there is no makeup day. All visitors to the Washington County Jail must show picture identification. No one will be allowed to visit an inmate without identification. No one who has been an inmate in the jail in the last year can visit an inmate. All children under the age of 18 must have a parent or a legal guardian with them in the visitation room. Inmates are assigned to a cell which they share with one other inmate. 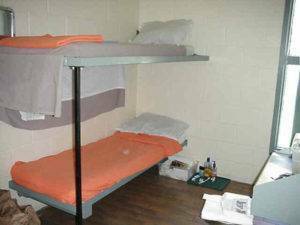 The cells include bunk beds, one toilet, & one desk. The cell are approximately 10 ft x 7 ft (or 70 square feet) in size. Inmates can be held in up to one year in the Washington County Jail and on many occasions – are! All meals are prepared on site by staff members & inmate trustees with the average cost of inmate meals costing $1.62 per meal. In 2011 approximately 33,672 meals were prepared for inmates housed in the jail. 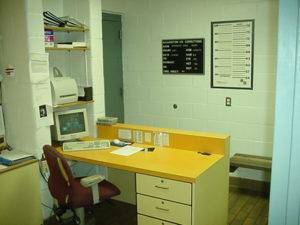 All inmates must be processed through “booking.” This process includes fingerprinting, photographs, as well as other booking procedures. All inmates are entered into the computer operated records management system, which details the inmates charges, medical condition, bond amount, etc. 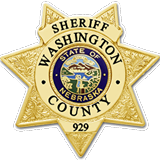 All inmates receive a copy of the Washington County Jail Handbook at time of booking, or will have access to the information in their respective housing units. It explains, in detail, the policies and procedures for the Washington County Detention Center. All rules, guidelines, and practices are governed by Nebraska Crime Commission – Nebraska Jail Standards Division. All information provided in this handbook is subject to change and all changes will take precedence over previous printed material.